I’ve been making a lot of cards using the die-cut masking technique I talked about in my previous post. I thought I’d share a few more of those cards with you today. Instead of using my copic airbrush for this card, I decided to do some ink blending with distress inks. You have to be a bit more gentle with this technique, however, because all of the blending can cause you to accidentally pull up one (or more) of your masks – ask me how I know. For the most part it works just fine. 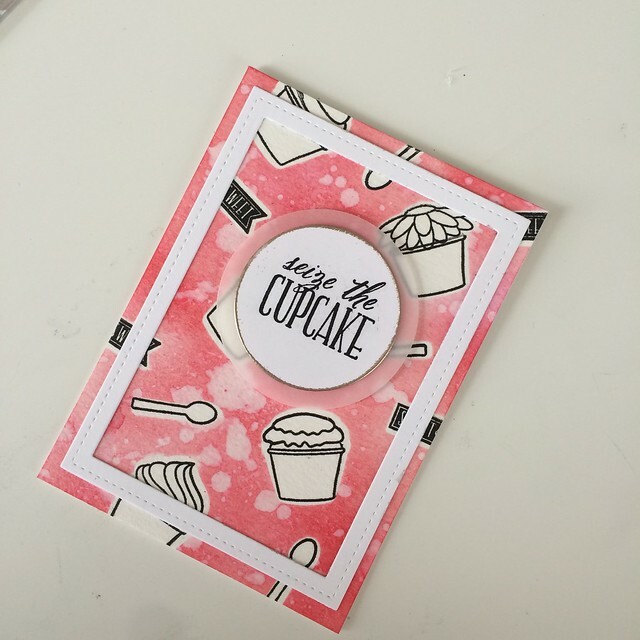 For this card I used the Wplus9 Sweets and Treats stamp and die set for the stamps and masks. 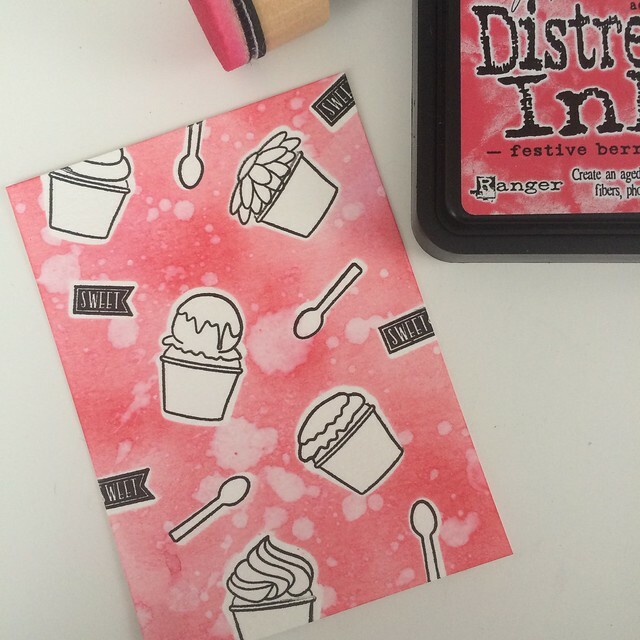 Once I finished ink blending, I added some water droplets onto the card and quickly soaked them up with a dry paper towel – that’s what gives the nice bleached out effect in some areas; One of the many reasons why I love distress inks. I popped up the sentiment on a circle die cut and added a little embossing around the edges and a circle of vellum behind. lastly, I added a stitched rectangle frame for a bit of added interest, before adhering everything onto a 4bar-sized card base. I wasn’t quite finished with my copic airbrush system yet, though, so I also made some 4bar get well soon cards using the same masking technique but changed it up a bit with some patterned paper and a little gathering of thread behind the sentiment. 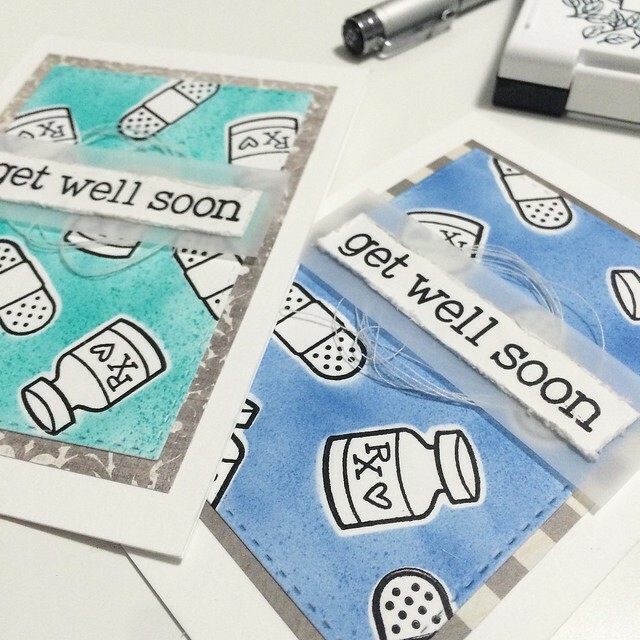 I used the Lawn Fawn Get Well Soon stamps and dies for these. Did I mention that I first got the idea for this technique from Dawn of Wplus9? She has a great YouTube tutorial on her channel that you can check out here! Super adorable! I love this idea. I bought masking paper and never use it. Ha!